St. George's Chapel has been given an overnight makeover with flower arrangements at the main entry door and inside the great room where Prince Harry and Meghan Markle will wed.
A cascading hedgerow style using native flowers and foliage graces the entryway. A similar display was inside. Senior chapel official Charlotte Manley said the flowers were put in overnight while other decorations were put in place in recent days. She said Markle helped choose the plants but has not seen them in place. That will happen when she arrives to be wed. The chapel was filled with light from the extensive stain glass window on a bright sunny morning as guests started to arrive. Oprah Winfrey and Idris Elba are among the first guests to arrive at Windsor Castle for the wedding of Prince Harry and Meghan Markle. The American talk-show titan and the London-born Hollywood star are among celebrities, royalty, athletes and family friends in the 600-strong congregation invited to St. George's Chapel in Windsor. Singer James Blunt has also arrived Saturday at the gothic chapel, where the wedding will start at noon (1100GMT). Royal relatives on hand include Charles Spencer, the brother of Harry's late mother Princess Diana. Royal fans have come from near and far for a glimpse of Prince Harry and Meghan Markle on their wedding day in Windsor. Hundreds camped out overnight to get a prime spot outside for the newlyweds' horse-drawn carriage near Windsor Castle after the ceremony. "I woke up wet, and I'm freezing cold, my back is sore, and I just want to go to bed," said Bernadette Christie, a Canadian from Grand Prairie, Alberta. "I'm here for that 10 seconds when that coach goes around the corner," she said. "It'll be well worth it." Farkahanda Ahmed came with her mother and a friend from Slough, a few miles from Windsor, arriving at 4 a.m. to get a good spot. The trio wore Union Jack hijabs in honor of the occasion. "It's a proud moment for us — times are changing," Ahmed said. "Who would have thought a Hollywood actress would become a British princess? "We are proud to be British and we wanted to come here and show our support." The members of the public selected for prime viewing spots for the royal wedding have started arriving. Alan Scott was one of the first arrivals among the roughly 2,600 people invited to watch the procession from the grounds of Windsor Castle. He was invited because of his 45 years of service to scouting, an activity that enjoys much royal family support. 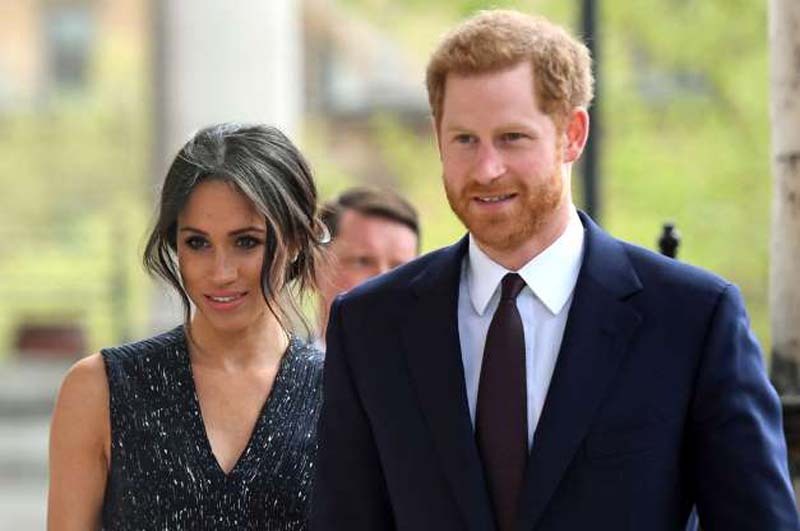 He will have a front row view of the wedding procession and hoped for a good chance to see Prince Harry and Meghan Markle after the ceremony. The 69-year-old Scott had come in from Lincolnshire the night before for the big event. "It's a great honor," he said of the unexpected invite. "The atmosphere is great. The royals are great supporters of everything and the young element is really coming through. I think they're going to take things forward." Royal watchers have swarmed the first trains from London to Windsor as they headed for the wedding of Prince Harry and American actress Meghan Markle. At the station in Slough, the changing point for travelers from London, revelers found sign boards reading "All aboard the royal wedding special to Harry & Meghan Central." Many of those on the standing room only trains were Americans, including Christine Clancy from Virginia. Clancy says she's "always been a royal fan — not an extreme one — I just love British history and love the royals. I just wanted to be part of the wedding celebration." Irene Bowdry, a lawyer from California, booked her trip with four friends as soon as the date was announced. She said "an American in the royal family, isn't that so exciting?" A team of five workers was adding boughs of green foliage and white flowers to a voluminous display surrounding the South Door of the chapel. The entrance will be used by guests arriving ahead of the noon ceremony. The wide open courtyard outside the chapel, known as the Lower Ward, was a hive of activity. Amid the bustle of castle workers, soldiers were carrying kit bags through the Henry VIII Gate into the castle grounds. Some children of residents of the castle were playing on the clipped lawns, which were bathed in the evening sunshine, as their parents smiled. Meghan Markle and her mother Doria Ragland have arrived at the exclusive Cliveden House Hotel where they will spend the night before the royal wedding. Both looked happy and relaxed after Ragland's first meeting with Queen Elizabeth II and her husband, Prince Philip, at Windsor Castle. She has now met most of the senior British royals since her arrival from California on Wednesday. Ragland will ride to St. George's Chapel on the ground of Windsor Castle with Markle on Saturday morning for the ceremony that will officially bring her daughter into the royal family. Tens of millions of TV viewers around the world are expected to watch at least part of her wedding to Prince Harry. The prince is marrying American actress Meghan Markle on Saturday in St. George's Chapel at Windsor Chapel in front of 600 guests and a huge global television audience. Archbishop of Canterbury Justin Welby said it's "wonderful" that Prince Charles will walk Meghan Markle down the aisle at her wedding to Prince Harry. The heir to the throne stepped in after Markle's father was unable to fly to Britain for the ceremony because of poor health. Welby, who will marry Harry and Markle at Windsor Castle on Saturday, says Charles is "a very warm person and that he's doing this is a sign of his love and concern and support. And I think it's wonderful. It's beautiful." Saturday's wedding has drawn intense international interest and is expected to be watched by tens of millions of television viewers around the world. The archbishop said Harry and Markle are "a very self-possessed couple" and the atmosphere in rehearsals has been "relaxed, laughing and enjoyable." The French may have overthrown their own monarchy more than two hundred years ago but for some there remains a fascination for the trappings of the royal experience. French admirers of the British royal family were getting ready Friday for the wedding between Prince Harry and actress Meghan Markle, with shops selling merchandise seeing brisk sales in recent days. The Franco-British owner of the "British Shop" in Paris' posh 16th district, Chantal Laserre, said customers have been rushing in to get souvenirs to mark the event. Laserre says "there's an interest for this wedding because she is Catholic and she is divorced and she is American. It's a big change in the royal family." Fresh out of Harry-and-Meghan dish towels, she was frustrated that she didn't order more in advance. All French news channels and other major television channels TF1, France 2, M6 will broadcast the wedding ceremony live on Saturday. British police are manning barricades and patrolling the grounds around Windsor Castle as authorities take on the massive security operation for the wedding between Prince Harry and actress Meghan Markle. The Thames Valley Police say guests and spectators will be subject to airport-style security scanners and bag searches. Royal fans are also being asked not to throw confetti, particularly during the procession, for police say "it poses a potential security risk and it's a bit of a pain to clean up!" Tens of thousands of spectators are expected in the town west of London for the newlyweds' carriage ride route after their wedding Saturday. Royal wedding fans camped outside Windsor Castle have expressed happy surprise that Prince Charles plans to walk Meghan Markle down the aisle during her marriage to Prince Harry. The fans decked out in the national colors of Britain and the United States had expected Markle's mother, Doria Ragland, to do it. Roseline Morris, a 35-year-old from Basildon, points out that Charles doesn't have a daughter. "So he's never going to get the chance to walk a daughter down the aisle, so this will be nice for him as well." she says. "I imagine he'll be feeling very proud." Sylvia Horn, 61, from Nashville, calls the decision "wonderful." She adds that "I fully approve since Charles is going to be her father-in-law." Buckingham Palace says the Duke of Edinburgh will attend the royal wedding — just a few weeks after undergoing a hip replacement operation. The palace confirmed Friday that Prince Philip would attend the wedding Saturday between American actress Meghan Markle and Prince Harry. Queen Elizabeth II's husband made his first public appearance since the April 13 surgery at the Royal Windsor Horse Show earlier this month. Kensington Palace says Prince Charles will walk Meghan Markle down the aisle at the royal wedding. Markle appealed for people to give Thomas Markle "the space he needs to focus on his health" amid reports he had had a heart procedure. As Queen Elizabeth II prepares to meet Meghan Markle's mother before the actress' wedding to Prince Harry, one commoner who married into the family is offering a bit of advice: Just relax. He says they will "go straight over and take away all of that tension straight out of the room, and that's what they are amazing at. Then suddenly you're in the family and they welcome you." Markle's mother, Doria Ragland, is set to meet the queen Friday. The big day is nearly here. Well-wishers are camped out, deliveries are arriving and a large security operation is in place a day before the wedding of Prince Harry and Meghan Markle. In a break from the care with which royal events are normally planned, some of the wedding details are still being worked out. Markle has yet to reveal who will accompany her down the aisle, after her father decided not to attend for health reasons. The bookies suggest Markle's mother may have the honor, but there also been speculation that one of her closest friends, Soho House director Markus Anderson, could step in to replace Thomas Markle, a reclusive former TV lighting director who touched off a scandal after allegedly being caught staging photographs with the paparazzi.